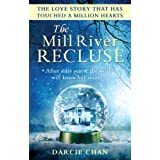 The Mill River Recluse by Darcie Chan. This book was recommended to me by my friend, Marallyn. She was in my previous writing group. Whenever I submitted yet another poor attempt to write about social anxiety, she said, “You must read The Mill River Recluse. That’s the way to write about social anxiety.” I’ve also seen the book praised elsewhere. However, I do have some reservations about it. Mary, the recluse, has social anxiety. The reason for this is mentioned three times in the book (which I thought a bit excessive) and relates to one terrible incident that occurred when she was sixteen. She mentions that she was always shy, but I still think this is too easy. One incident, however bad, doesn’t cause social anxiety on its own. There has to be a lot more than that. I would have liked to have heard much more about Mary’s childhood and what led to her condition. The consequence of Mary’s anxiety – becoming a recluse seen generally by only one other person and later by two others – is a very extreme outcome of social anxiety. This is mentioned in the book by a professional who meets her and says, “I’ve never seen such an extreme case of social anxiety.” Most people with social anxiety don’t keep themselves completely hidden in that way. They force themselves to get out and function in society however much of a struggle that is. I think someone who reads of an extreme case like this could make light of the effort made by someone who appears to function fairly normally. I entirely agree with you. It’s all too easy for people to treat those suffering from social anxiety as if it’s of little consequence. It’s a painfully disabling condition. Quite often only those who suffer from it can really appreciate what another.sufferer is going through.